These on-line news pages complement our printed newsletter, printed 4 or so times a year. Most of the content is the same, except that the pictures are in color and some of the news may be a little different. But, if you want to get on the printed newsletter mailing list, contact the office. Please be patient with these pages if you have a slow modem. Most of them are full of pictures, although they have been shrunk to the absolute smallest. If you want better copies of any picture, or different pictures from our vast collection, write us and we'll send them to you. Do you like your news fresh? 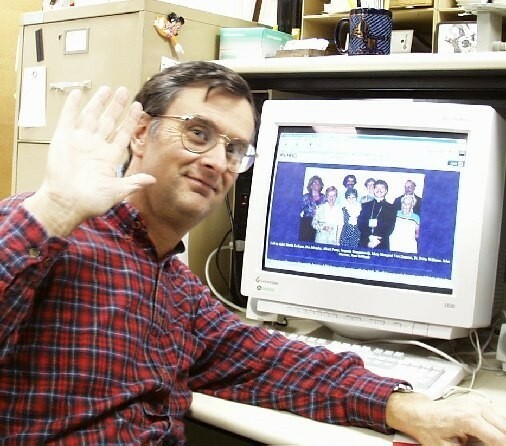 Write to the Webmaster, Jim Van Damme (here's his picture) and he'll notify you when there's another news page to read. Here's a list of our Newsletter supporters among the churches and organizations. Find out what's happening in our Church: there are several links on our links page which can daily e-mail you Church news, Bible readings for the Mass of the day and meditations. Subscribe to the Catholic Sun: catholicsun@yahoo.com The weekly newspaper for the Diocese of Syracuse New York. Or you can phone in your subscription order (voice only) to: Geri Schafer at (315) 422-8153 or 1-800-333-0571. November 2005 - Jan. 2006 It's Christmas already? September-October 2004 Mattie, Scranton, Douglaston, Camp Mark 7, where's this Deaf School? October 2001 Happy All Saints Day!!! October 1999 An angel, where's Fr. Peter?